We believe that the most popular vacation planning and booking websites will have to respond to increased web traffic during the summer travel booking period. We have selected twelve popular travel websites from US, Europe and Australia that rank at the highest search engine positions. We will monitor these sites continuously from May 16 through June 30, 2007 and measure the performance levels and the availability of these websites independently and from various remote worldwide monitoring locations to best reflect the End Users' experience. 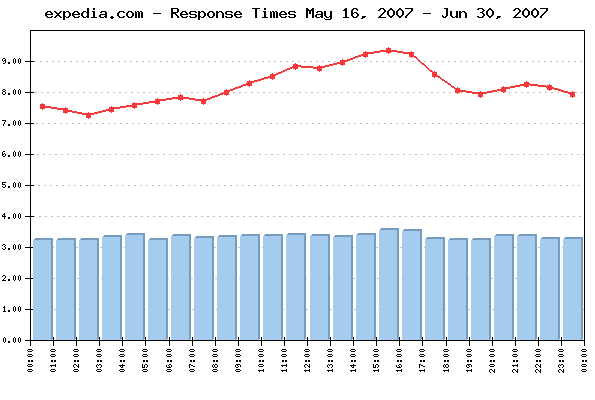 Continuous monitoring for all websites covers the period May 16 through June 30, 2007. The reports and charts are updated daily showing the results from the previous day and for the entire monitoring period to the current date. 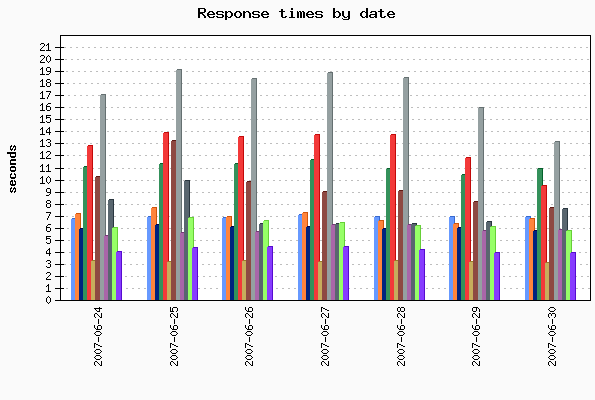 The daily Average Response time from all monitored websites was 7.198 sec. The Average Response time as measured from the US East Coast (Washington, DC) was: 4.779 sec. The Average Response time as measured from the US West Coast (San Francisco, CA) was: 6.041 sec. The Average Response time as measured from Europe(Amsterdam, Netherlands) was: 7.259 sec. The Average Response time as measured from Australia (Sydney, NSW) was: 10.713 sec. The Best Response time measured from the US East Coast was: 1.623 sec. The Best Response time measured from the US West Coast was: 1.159 sec. The Best Response time measured from Europe was: 1.548 sec. The Best Response time measured from Australia was: 1.506 sec. 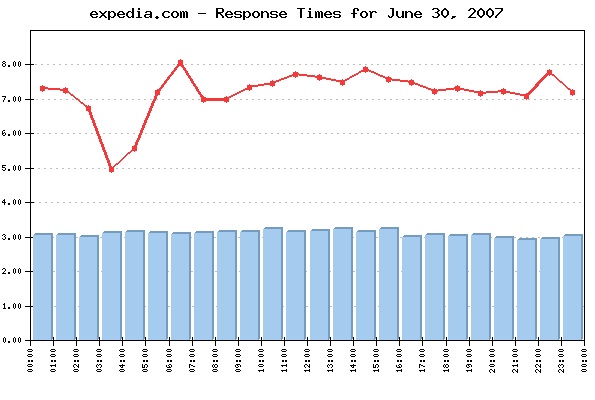 The typical transaction loading took the least time for expedia.com visitors - 3.081 sec., while the visitors of orbitz.com had to be the most patient, as the loading there took in average of 13.082 sec. Five of the monitored websites delivered above-the-average response times for their shopping transaction, while seven of them demonstrated below-the-average daily performance. The daily average uptime for the entire Group was 98.94%. Orbitz.com and CheapTickets.com performed site maintenance early in the morning. The downtime lasted from 3am to 4:30am EST.